Success is something we all measure differently, and for so it is important to know how each person values their success. 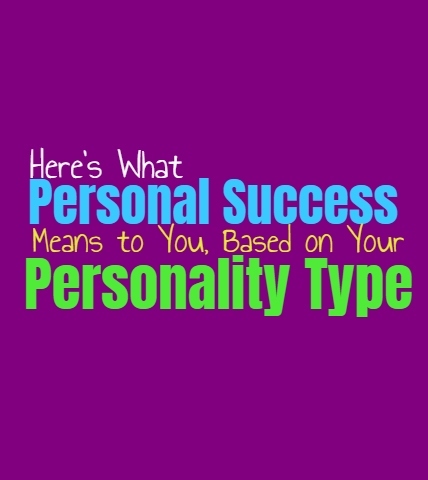 So here is what personal success means to each personality type. INFJs rarely measure success by society and the way the masses will view these things. For them a sense of accomplishment comes from achieving something which is bigger than themselves, and something which isn’t quite so shallow. Even if the INFJ gets that big promotion, or gains a sense of popularity, this often feels hollow for them. INFJs measure success by being someone who continues to accomplish their personal goals and at the same time doing this with a strong moral fiber. ENFJs can be rather hard on themselves so for them success often means a great many things. They push themselves to achieve a sense of perfection in everything they do, or else they don’t feel successful in those accomplishments. ENFJs often measure success by the people around them, and if their loved ones are proud of them. They want to be someone that others love and trust, and this is deeply important for them. If the ENFJ feels like they have made people happy and continue to please those around them, they will certainly feel successful. INFPs don’t often measure success by the standards of society, and so the way they see things is often quite different. They measure their own personal success by their ability to make a difference, and their sense of moral courage. They can actually be rather hard on themselves, and rarely do they feel successful even if they should. INFPs want to be someone who can help others and really enrich their lives, but they also want to make a difference on a much larger scale and this is something which might be hard for them to let go of. ENFPs can have a hard time measuring their own success, this they have higher standards than people realize. ENFPs rarely feel successful enough, always believing that they could be doing better or achieving more. They want to be someone who makes a difference in the world and makes their loved ones proud of them. ENFPs can often compare their own success to those around them, wanting to be able to push themselves harder. ENFPs often measure their success much better if the people they love support them and express that they are proud of the ENFP. INTJs often measure their personal success by their ability to grow and continue moving forward. They never quite feel done or satisfied with themselves, always wanting to improve and be even better than before. INTJs often measure success by how much knowledge they have and their ability to really make something happen from this. The more ignorance they can remove from themselves and the world around them, the more successful the INTJ will feel in their lives. ENTJs measure their own personal success by rather high standards and never quite feel like they have lived up to them. They are perfectionists who want to always be moving forward and seeking out ways to improve. They work very hard to accomplish their many goals in life, but they always want to be building more goals and find themselves never quite ready to calm down. ENTJs measure success by their ability to get things done efficiently without allowing anything to hold them back. INTPs can be somewhat hard on themselves, never really knowing how to measure their own success. They can sometimes find themselves measuring success based on comparing themselves to others in the same situation as them, which is something that can be hard on the INTP. They find themselves never truly feeling successful enough, even though they have often accomplished more than they realize in life. It is hard for them to ever feel completely successful or accomplished in life, which can be challenging at times. ENTPs often measure success much differently than others do, not only weighing this based on accomplishments. ENTPs measure success by how much they are willing to learn and always keep growing. Even when they have accomplished something great, the ENTP does not want to settle for this and instead wants to find ways to keep moving forward and continue improving. For them success means never remaining stagnant and always searching for something new to experience and challenge themselves with. ISTJs often measure success by many things, and can be rather hard on themselves when it comes to feeling truly successful. They feel like they are successful when they have achieved their goals and can continue to provide stability and provide for the needs of their loved ones. Being someone who is revered in their workplace as driven and good at their job, is a great measure of success for the ISTJ. As well as being someone who is taking care of their family and is capable of shouldering this burden. ESTJs often measure their own success by how well they can accomplish their goals with a strong sense of efficiency. For them it isn’t just about getting the job done, but about perfecting their abilities and ensuring that everything is done efficiency. They don’t just believe in finishing things, they also believe in ensuring that they do this to a certain level of perfection. For the ESTJ success is measured by their ability to always be efficient, as well as their ability to provide for the practical needs of their family and loved ones. ISFJs often measure their personal success by their loved ones and how happy they are. Their ability to create a sense of harmony and joy in their environment, is the major marker for success to the ISFJ. They work hard to make sure everyone around them is cared for, and they do many things in order to ensure this. They want to be able to always swoop in and save the day when things go wrong, and this is often how they feel successful in life. ESFJs often measure success by many things, but most of all it is their ability to tend to the needs of those around them. The happiness of those they love is often how the ESFJ measures their own personal success. They feel if they can continue to provide for their family and ensure that they are happy, then the ESFJ often feels a great sense of internal success. For them it is vital that they can do whatever it takes to protect their loved ones and create a sense of harmony in their lives. ISTPs don’t often focus on the type of success that most people do, instead they measure success by their own very personal goals. They want to be sure they continue to remain open to new ideas, as well as new experiences. For the ISTP success is measured by their growth and constant ability to fight for the things they want. They feel successful if they are capable of exploring their options and have the means to do so. ESTPs often measure success by many things and can have high standards of what they believe they should accomplish in life. They want to be someone who makes their loved ones proud, and this can often be a way in which they measure their success in life. They work hard to achieve their goals and they truly want to be able to feel a sense of pride in them. ESTPs feel successful if they can move up in their careers, as well as maintain their social lives. ISFPs often measure success much differently than most people do, with their own personal standards. They care about doing the right thing and want to be someone who makes the moral choices in life. For them success is being true to themselves, and always seeking out growth and change. ISFPs care about being someone that others can look up to, and this can also affect how they measure their success in life. They want to have personal relationships which are deep and lasting, and this makes them feel more successful. ESFPs often measure success by their ability to make others care for them, and by just how loved they are by others. They want to be someone who people care for and want to feel like they have helped bring positivity and light into the lives of those they love. For the ESFP success isn’t all about their careers, although this can certainly be something which is important to them. It is often more about their relationships and who they are connect to.